At a recent Andes Bi-Centennial planning meeting at the Andes Hotel, facilitator Robyn Ciccone reported that ACS Superintendent Dr. Chakar has notified her that due to multiple construction projects going on this coming summer, the school grounds will not be available for vendors and activities on Community Day (Saturday, August 10th). The school bus garage parking lot could be used, but some felt it would be needed for parking. 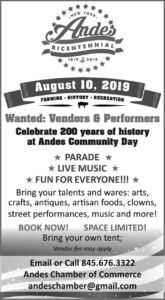 Vendors and performers are still welcome to participate as numerous designated areas along Main Street will be available. Please contact the Chamber for more information and vendor application. 845-676-3322 email: andeschamber@gmail.com. Cyndi Wright, owner of Dirty Girl Farm, located across from the school, reminded the group that she and Lester are always open to hosting appropriate vendors and activities (sindiderecha@hotmail.com). Bill Day proposed a lively cluster of events that he would plan and produce for the weekend prior to Community Day (August 3rd & 4th). The people present at the meeting liked his ideas. Once approvals of the venues are granted, you will see details on these pages.